The Alto TX2 series of high-performance loudspeakers borrow some of the legendary technology from Alto's acclaimed Truesonic series, but with a more affordable price tag. This second generation lineup adds even more power and a larger frequency spread whilst remaining lightweight. Connectivity has also been upgraded making the Alto TX2 range even more flexible for your performance needs. The Alto TX212 Active Loudspeaker is able to give you the level of power that it can thanks to the inclusion of an efficient class-D amplifier. This remarkable amplifier can power out an impressive 550 watts of continuous power (300 LF + 200 HF). Class-D technology also means that the amp wastes less energy by creating less heat, focusing more on the audio that you need. The power from the amplifier is then sent through a precision crossover system that splits the signal between the horn and driver at exactly 2.5 kHz. This means you get the best frequency spread without interference over the 70 Hz to 20 kHz range. Voices will project with clarity, instruments will be faithfully amplified and whatever your playing environment, your mix will cut through with utmost clarity. A 12-inch woofer handles all the lower frequency and is driven by a 2" voice-coil. This is in contrast to the crisp output of the 1" titanium diaphragm HF driver with 1" voice-coil. The Alto TX212 has a beautifully simplistic rear panel for a no-fuss, simple set up. You will find an on/off switch, a connection for power and also 2 XLR/TRS combo inputs as well as an XLR 'mix' output so you can send your mix signal out to another speaker or monitor. In addition, a contour switch gives you an elevated frequency curve whilst a ground lift switch eliminates hum that could be generated by electrical interference. The TX212 incorporates a trapezoid design which makes it ideal for both a front of house PA speaker or as an onstage wedge monitor. There is also a built-in pole-mount socket as well as a comfortable carry handle on the side. Flexible, easy to use, comfortable and very powerful, the Alto TX212 Active Loudspeaker would be a welcome addition to pubs, clubs, places of worship, gymnasiums and more. 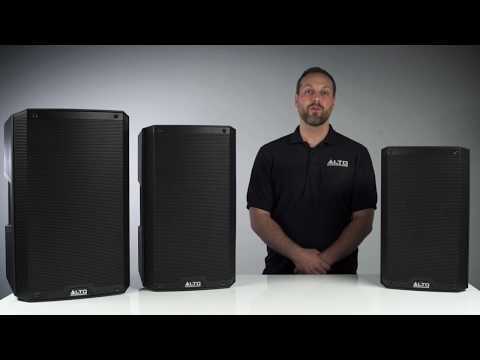 Time for you to experience the clarity of the Alto TX2 series loudspeaker system.